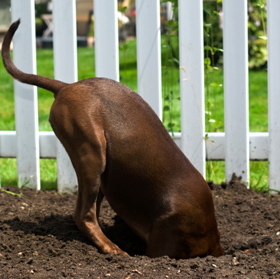 What to do when Your dog is digging holes at Your yard? So, you brought home a new family member - a dog. Every day you see how it grows and develops. But there are some moments in her behavior that you do not understand. For example, what is the need for a dog to dig holes? What caused this and whether such behavior is normal? There may be several reasons for this behavior. One of them - a natural instinct. In hunting dogs digging holes is necessary due to the fact that they are mentally trying to look for burrows of animals - foxes, badgers ... For such dogs as terriers and dachshunds this kind of behavior is normal and natural. It happens sometimes that your dog is bored. No one is at home, and your doggie (especially if she is young) wants to run and play with someone, so she is finding herself some entertainment. Sometimes she growls or starts to dig burrows, especially near the fence. After all, there is so many interesting things on the other side!To make sure that your new best friend will not suffer, try to spend more time with him and if you need to leave him at home alone - take care of him in advance. Buy several different dog toys that will occupy the attention of the dog for a long time. Sometimes the reason to dig holes under a fence can be a sign of a desire to females or males to mate. In this case, listen to the needs of the animal. Find him a couple, or get him castrated if you are not planning to have his offspring. In the hot summer days, the dog is looking for a cool place. And since the lower layers of the land are less susceptible to the sunlight, so she "dig deep" to find a comfortable and cool place. If you will arrange for your pet some shadow maybe he will not be so eager to dig and destroy your yard. Some dogs like to make "stocks", to bury a bone in a secluded place - this is one of the engines of instinctual digging. And if you fertilize the soil in the garden substances which include the bone or blood flower, it's alluring smell will not let the dog to rest. She will always dig searching for food. If you own a female dog, you have to take into account that at the time of pregnancy, she may dig trying to find a place for the puppies. Arrange a special place in your yard, where it will be allowed for your dog to dig. It is preferable to fill in a designated section with a special loose soil silt sand. It is better to give preference to the sand, that can be peeled off easily. And try to train your dog to dig only in designated areas. You can train your dog in a playful way. Bury his beloved dog toy and give the order to dig (like: "dig here"). Gradually, your pet will learn the place for digging. If you notice that the dog is digging in the wrong place, give a forbidding command (for example "No!" or "Stop it!"). Digging is a part of a dog's nature. So now there are loads of special dog safe chemicals for sale in pet stores, that will help you to wean the dog from this instinct. This may be a means of strong repulsive odor. They can be sprinkled on the ground as well as on plants. No matter which advice you are using, the most important thing is your positive attitude and your desire to help your dog to get rid of a bad habit.